"It is a shame that FIBA has decided to let bureaucracy stand in the way of religious freedom,” said Sona Simran Kaur, Sikh American Legal Defense and Education Fund (SALDEF) Communications Director, after the International Basketball Federation declined to make a decision at its Central Board meeting about players wearing religious headgear, deciding instead to defer to further study. My article at NBCNews Asian America. Check out the photo on the landing page to see what the building looks like now, post earthquake. “It's a memorable part of California history when Chinese immigrants faced virulent discrimination and were denied a livelihood,” said Margaret Fung, Executive Director of the Asian American Legal Defense and Education Fund (AALDEF), “Kee stood up for his rights and successfully challenged the town's discriminatory ordinance creating a ‘laundry-free’ zone in 1887." APACC's premier Women's Leadership Conference is a half day of inspiration and empowerment designed with ALL Women in Mind. Register for this event: APACC Women's Leadership Conference "Women Who Lead: Emerging Cultural Successes"
Congratulations DAY (Detroit Asian Youth) Project on your 10 Year Anniversary Celebration today! I'm reading some new material tomorrow, Friday 8/22/14, at 7 pm, at Brewed Awakenings Cafe in Saline if you are interested. I wrote an email last week but forgot to send it. “Nina's short stories embody the complex, richly textured and unexpected stories of being an outsider in the wildness of the American west and her compelling collection ‘Cowboys and East Indians’ is impossible to put down,” said Asian-American poet and editor of Drunken Boat, Ravi Shankar. The Detroit Vincent Chin mural is caught in the crossfire of a turf war. May 2014- Details of the mural were organized and confirmed. GAIA requested that we make contact with Vincent Chin's family to approve and provide their blessing of the mural. We were led to the "American Citizens for Justice", "a nonprofit 501c3 organization serving the Asian Pacific American (APA) communities of Michigan and fighting for the civil rights of all Americans. It was founded in 1983 after the baseball beating death of Vincent Chin." Details and imagery were sorted out then mutually approved. Artist travel itinerary, accommodations, supplies, equipment and mural location were confirmed. June 18, 2014- GAIA arrived to Detroit. June 19, 2014- GAIA met building owner, created conversation, and building owner gave his blessing. The building owner respected the idea of a memorial mural and related to the challenges Vincent Chin faced. GAIA met Detroit graffiti artist SINTEX, who had previously had a mural on the wall. (All of the GRCC walls rotate artists every 1-3 years. Several other walls have been successfully rotate without any conflict.) GAIA explained his mural concept and SINTEX gave his blessing by saying "I've had my mural on the wall for a couple years now and now it's yours". June 19- June 23, 2014- GAIA created the Vincent Chin Memorial Mural. June 23, 2014- GAIA departed Detroit. August 9, 2014 at 6:37am- Derek Weaver, founder and curator of the GRCC, received a text message from Detroit graffiti artist "SINTEX" that stated "The mural in the parking lot got hit..looks like justo...blk buff line all thru it..signature justo ..or justd". Derek living only 15 minutes, away drove to the mural to find that the black paint was still wet and dripping. Derek decided to try and save the mural and washed 90 percent of the black paint off with a water hose. From there, several Detroit artists offered to help fix the mural and plans were scheduled to do so. August 11, 2014- SINTEX told Derek that the wall needed to be repainted. Derek then explained the plans to restore the mural. SINTEX expressed frustration and disapproval. August 12, 2014- Derek received a phone call in the late afternoon from SINTEX demanding he purchase a 5 gallon of black paint to cover the mural. SINTEX stated that he spoke with the building owner and received his permission to repaint the wall. Derek told SINTEX not to repaint the wall until Derek had an opportunity to speak with the owner directly and reminded him that the wall was scheduled to be fixed. August 13, 2014 at 7:35am- Derek received a text message from another artist that said "Omg 1/4 of the gaia mural is buffed". Derek arrived shortly thereafter and discovered that SINTEX had “buffed” the mural overnight. SINTEX accepted responsibility via Facebook posts/messages. August 14 to Present- Several claims and threats have been made by SINTEX via Facebook, Instagram, in-person, and Phone/Text. SINTEX removed and painted over the remaining wall and started painting his own mural. He made several mentions that it was his wall and Detroit is a “No Fly Zone” and GAIA never had the right to paint it. The Grand River Creative Corridor and the 4731 Arts Incubator will no longer support SINTEX financially or personally, his art, housing, or work space. SINTEX currently resides in the 4731 Art Incubator, located within the Grand River Creative Corridor. SINTEX was one of the lead artists in the early-age of the GRCC and painted 4 or 5 murals. SINTEX was provided a 6,000 square foot loft free of charged for 2 years. Recently, the City of Detroit inspected the loft and deemed it unsafe and uninhabitable for residential use. SINTEX was given notice in May of 2014 that his occupancy would be ending. SINTEX has made no indications of moving out of the loft. The Grand River Creative Corridor, also known as “GRCC", is an art corridor and neighborhood revitalization project concentrated on Grand River Avenue between on a half-mile stretch just outside downtown Detroit, Michigan. Founded on July 15, 2012 by Derek Weaver, the project features over 100 murals on 15 buildings; an outdoor fine-art gallery at a bus stop; free-standing art installations; a cleanup of overgrown vegetation, trash, and vandalism; and an economic stimulus project for local businesses. The project involves over 100 local and international volunteer-artists and is an ongoing effort to transform Detroit’s infamous Grand River Avenue into a creative hub that attracts: tourists, artists, small businesses, entrepreneurs, and investors alike. Check out Sugi Ganeshananthan﻿'s Rage in response to events in Ferguson, Gaza, Sri Lanka. my article for NBCNews Asian America, "Your rage looks just like that other rage! Do they know each other?" in the World Journal at Chinese New Year's time... My folks will be so proud! Love this! Covering the Asian American community at Asian American Journalists Association 2014 #AAJA14 #AAJA2014 convention with all my friends, Angry Asian Man Phil Yu, Emil Amok Guillermo AALDEF, Gil Asakawa Nikkei View, plus future friends Hansi Lo Wang NPR CodeSwitch, Ernabel Demillo CUNY-TV Asian American Life, Shefali S.Kulkarni Global Nation. Shout out to NBCNews Asian American (52:00 mark) and Karthik Ramakrishnan (57:00 mark) AAPIData.com and AAPIVoices.com. Hurrah for data! Joseph Ileto, Ismael’s older brother, died Aug. 10, 1999 after being shot by Buford O. Furrow Jr., who had opened fire on five people at the Jewish Community Center in Granada Hills before encountering Ileto, who was working as a mail carrier in Chatsworth. "I love to read, especially Asian American authors. But do you know the feeling of finishing a great Asian American novel and wishing you could turn to someone and talk about it?" 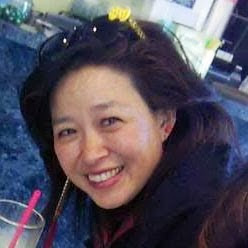 asks freelance writer Grace Hwang Lynch on her blog HapaMama.com. Lu’s new study, recently published in Health Psychology, found that regular, expressive writing about one’s deepest fears, emotions, and the benefits of a cancer diagnosis has both short-term and long-term physical and psychological health benefits for Chinese-speaking breast cancer survivors, including decreased fatigue, fewer intrusive thoughts, reduced post-traumatic stress, and increased quality of life. Key to these results, said Lu, is the writing instruction. Study participants were asked to write for twenty minutes a week for three weeks based on different prompts. Participants reported that they revealed emotions and experiences in their writing that they had not previously told others.